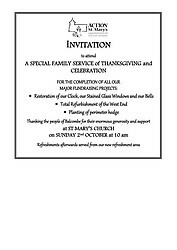 Saturday 04th May from 2.00pm to 5.00pm. Birchanger is on the B2110, two miles EAST of Handcross, and two miles WEST of B2036, near Cowdray Arms pub. from the 17thCentury to the present day. Balcombe Mothers’ Union are hosting a Harvest Lunch on Thursday 11th October, 1.45pm, in the Parish Room. 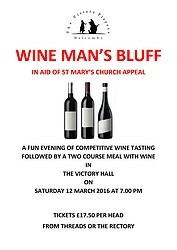 Proceeds will go to the MU Harvest Appeal which aids survivors of war and natural disasters. All are very warmly welcome to join us for a delicious lunch of homemade soup, bread, and apple crumble. Saturday 29th September 2018 travelling by coach from Balcombe to the interesting town of Windsor and its Castle. The Castle andSt George’s Chapel have been in the news recently for the Wedding of PrinceHarry and Meghan Markle – see where it all happened! 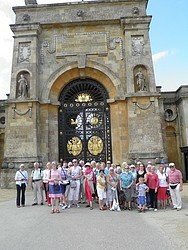 Have your own opportunity to experience the wonder of the largest and oldest continuallyinhabited castle which has witnessed so much of this country’s history andpageantry having been home to 39 monarchs since William the Conqueror. Many of our former monarchs have been laid to rest in the chapel including King Henry VIII, King Charles I and the Queen Mother & Princess Margaret. The castle experienced a serious fire in 1992 and was lovingly and beautifully restored by traditional craftsmen – see the results for yourself. The town of Windsor is on the banks of the River Thames and has some lovely shops and places to find refreshment – there will be time to explore. On Sunday September 16th, Balcombe had a chance to unite to remember and celebrate its role in World War One. Using the beautiful murals in the Victory Hall as our inspiration, we reflected on the events and joined in the old war time favourite songs and heard afresh the part Balcombe played in the Great War. 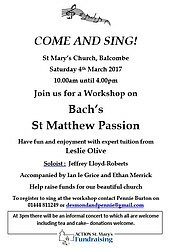 With contributions from Balcombe School, The Victory Players and St Mary’s Choir. We thoroughly enjoyed a wonderful afternoon. Thank you to all those who arranged the event. Annual Parish BBQ. 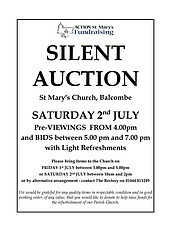 Parish Room, Balcombe from 12noon. Songs of Praise Service on Sunday 22nd April at 6pm for St George’s Day. We had a wondeful concert with Christmas music and readings, plus an opportunity to join in singing some of our favourite carols. 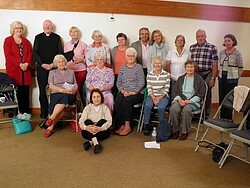 We are very grateful to the English Arts Chorale for, once again, coming to St Mary's Balcombe. 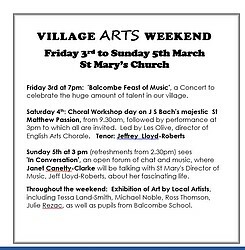 Friday 3rd at 7pm: 'Balcombe Feast of Music', this Concert celebrated the huge amount of talent in our village. Sunday 5th at 3 pm (refreshments from 2.30pm) sees 'In Conversation', an open forum of chat and music, where Janet Canetty-Clarke talked with St Mary's Director of Music, Jeff Lloyd-Roberts, about her fascinating life. 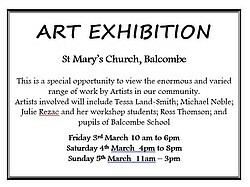 Throughout the weekend: Exhibition of Art by Local Artists, including Tessa Land-Smith, Michael Noble, Ross Thomson, Julie Rezac, as well as pupils from Balcombe School. 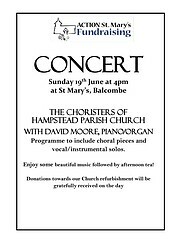 A BALCOMBE FEAST OF MUSIC! 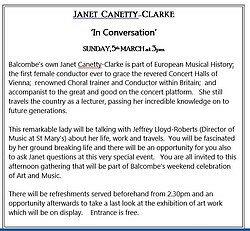 Balcombe’s own Janet Canetty-Clarke is part of European Musical History. 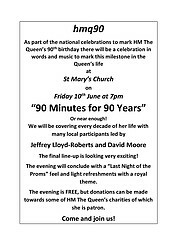 This remarkable lady will be talking with Jeffrey Lloyd-Roberts (Director of Music at St Mary's) about her life, work and travels. You will be fascinated by her ground breaking life and there will be an opportunity for you also to ask Janet questions at this very special event. There will be refreshments served beforehand from 2.30pm and an opportunity afterwards to take a last look at the exhibition of art work which will be on display. Entrance is free. This is a special opportunity to view the enormous and varied range of work by Artists in our community. 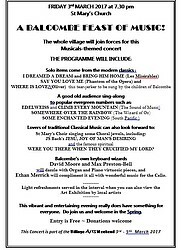 Programme to include choral pieces and vocal/instrumental solos. Enjoy some beautiful music followed by afternoon tea! 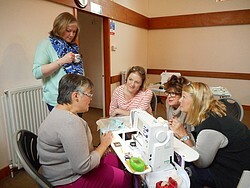 Several very enjoyable workshops have taken place recently, including bread making, music, flower arranging, bell ringing, needlework and quilting, cards and crafts and a chinese cookery demonstration. Ardingly Prep School gave us yet another wonderful concert on 6 May, raising some £400 for our major projects fund. 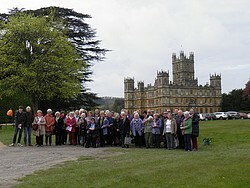 Over 50 people enjoyed a trip to Highclere (better known as Downton Abbey) on 2 May. 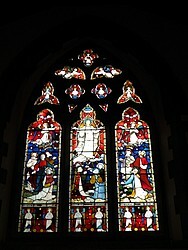 The restoration of the East End windows has now been completed and they are now back in their full glory. 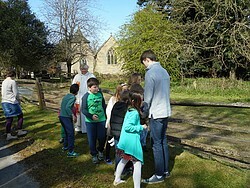 The sun came out for Rogation Suday on the 1st of May. Maybe some of the seeds that were scattered will make the most of the good weather and grow. 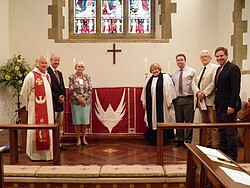 July 2015- The dedication of the new altar cloth (designed and made by Paul Milton) by Fiona Windsor, the Archdeacon of Horsham.